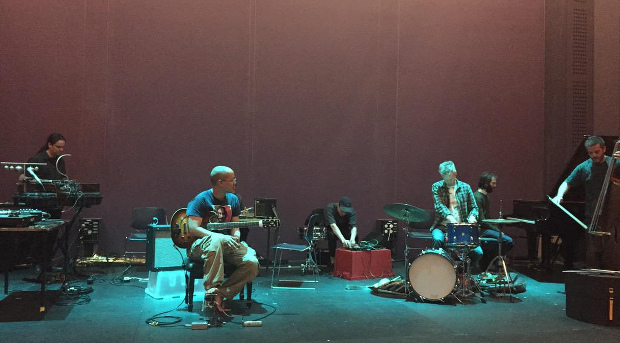 Thoughts and questions in response to Translating Improvisation’s symposium back in May from the POV of an institutionally unaffiliated, sometimes teacher, amateur scholar and anthropologist [previous twitter transcripts…]. Below the fold is an unedited twitter transcript of my observations from Just Improvisation. My original observations came in the form of tweets (some written ‘live’, most posted subsequently) via @hanearlpark that spanned the first panel discussions, Ellen Waterman’s keynote presentation, concert performances by Okkyung Lee and Maria Chavez, the Deep Listening Workshop with Pauline Oliveros, and the workshop-performance which forms the main subject of my discussions. My questions and observations are indebted to discussions with @franzschroeder, @wildsong, @tomarthursmusic, @pauljstapleton, @MortButane, @olivep, @davekanemusic, @zeittraumism, @nickreynoldsatp and @JoshSinton both on- and off- the twitterverse. May 31: 11. …Were we waiting for (or in need of) the ‘leader’ (such as @olivep) in the #justimprovisation ensemble…? Jun 24: 49. …Nuclear option? I floored it: volume pedal toe down, playing at eleven… #justimprovisation? or #unjustimprovisation? May 29 and 30, 2015: as previously posted, I’ve been invited to participate in Just Improvisation: Enriching child protection law through musical techniques, discourses and pedagogies. See below for the program including the list of musicians involved. The symposium, organized by Translating Improvisation, takes place at the Sonic Arts Research Centre (Queen’s University, Belfast, N. Ireland). Admission is free, and the event is open to the public. 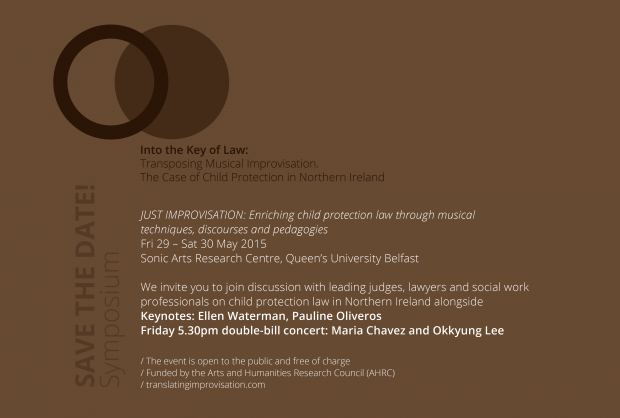 May 29 and 30, 2015: I am honored and excited to be invited to participate in Just Improvisation: Enriching child protection law through musical techniques, discourses and pedagogies. The symposium, organized by Translating Improvisation, takes place at the Sonic Arts Research Centre (Queen’s University, Belfast, N. Ireland). Admission is free, and the event is open to the public. 05–16-15: see update for program and list of participating musicians. Idiom, tradition, identity, history (personal or collective) are things that I value. I tend not to subscribe to the vanilla notion of a pure, non-idiomatic state. I value the meeting: I want to know who you are, who I am, and that fascinating stuff is when those things collide—what we have in common, and what separates us. Border crossings are always fascinating; full of contradictions and (potential) misunderstandings…. …Meetings and border crossings make me think of brief encounters, limited investment, not long-arc relationships. Is that what free improvisers are left with: connecting only in that moment? Is that initial collision potentially more interesting to hear than when musicians get to know each other intimately (and calculate accordingly)? 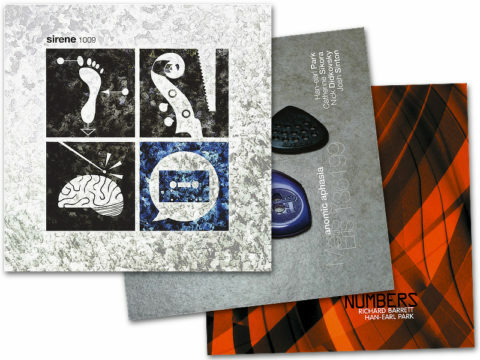 …I do value the band, of long-term collaborations. It allows for greater complexity of interaction, greater speeds of decision making, more oblique, unexpected, choices. We, Eris 136199, coined a new term—‘weirderation’—after our last performance, to denote something—a set of relationships, decision making process—getting just that little bit weirder with each iteration. On the other hand, spaces such as Crucible Sound have their own value. I’m not sure ‘brief encounters’ necessarily equates to ‘limited investment’ in those relationships. Metis 9 is a collection of improvisative tactics, and higher-level interactive macros for ensemble performance designed, designated and specified by Han-earl Park. Metis 9 has ‘glorious noise’ or ‘frenzy’ at its root, yet it is not so much structuring the noise as it is a meta-layer of complexity that performers can introduce at will. Metis 9 does not tell the performer what to play, or provide all the details of how to interact, but it is an additional network protocol for interactive possibilities. Group improvisation is always the primary protocol; Metis 9 provides secondary or tertiary tactics that create an additional focused complexity. The decision for each bloop and bleep is still retained by the ensemble. These macros enable specific interactionist schemes to be expressed in an open improvisative context; it is improvisative play channeled by group consent. Metis 9 builds on my experience teaching improvisation at University College Cork, and performing as part of large ensembles led by Ishmael Wadada Leo Smith, Evan Parker and Pauline Oliveros. 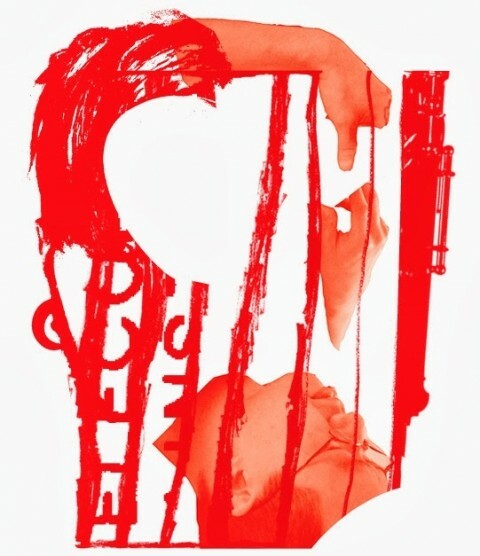 Metis 9 includes tactics developed from performances and practices of Cecil Taylor, Tony Oxley, John Zorn and Anthony Braxton, in particular, and the form of its practice (training and instruction) is inspired by the ensemble improvisation-composition works of George E. Lewis among others. I am seeking opportunities to perform Metis 9 in small and large ensemble contexts with, at its core, the trio of Han-earl Park, Catherine Sikora and Josh Sinton. In particular, I am seeking performance opportunities for Gargantius Effect +4 (Murray Campbell and Randy McKean with Gino Robair, Han-earl Park, Catherine Sikora and Josh Sinton) in October 2013 in North America (contact me for other locations and dates). Interested promoters, venues and sponsors, please get in touch!